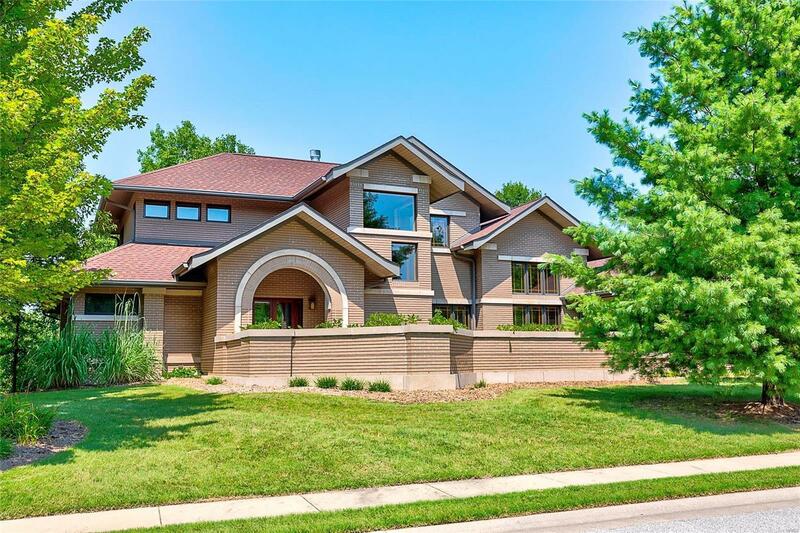 Frank Lloyd Wright-inspired architecturally unique 1Â½ story light-filled Prairie Style home on a coveted, peaceful Far Oaks drive. This home has many green features plus many authentic touches such as real limestone and attention to historical and stylistic detail. Expansive brick terrace. 22 ft Great Room ceilings! Huge, newly-renovated kitchen with Thermador appliances & unique etched stainless steel backsplash. See-through slate fireplace divides living & great rooms. 1st floor master, plus a flex-suite with private bath offers your choice of second master BR suite, study, music room or living room. Commercial-grade Brazilian cherry and heated slate and travertine floors. Huge basement. Custom woodwork. Geothermal heat/cool and water heater assist. Spacious basement. Perennial gardens and intentional landscape design bring cascades of color. This home is a true living work of art. OâFallon Schools. See the HD video and schedule your viewing today!